Beechdown Club is a haven for families... and as we all know, the most important members of the family are the smallest ones. If they're safe and happy, the adults can relax. Beechdown Club provides much more than just care and coaching... but that's quite a good start already!! Extensive facilities for babies through to teens. Read below for all details of the kids' facilities. PLEASE NOTE: Children Under 16 are not allowed in Club without a parent present. 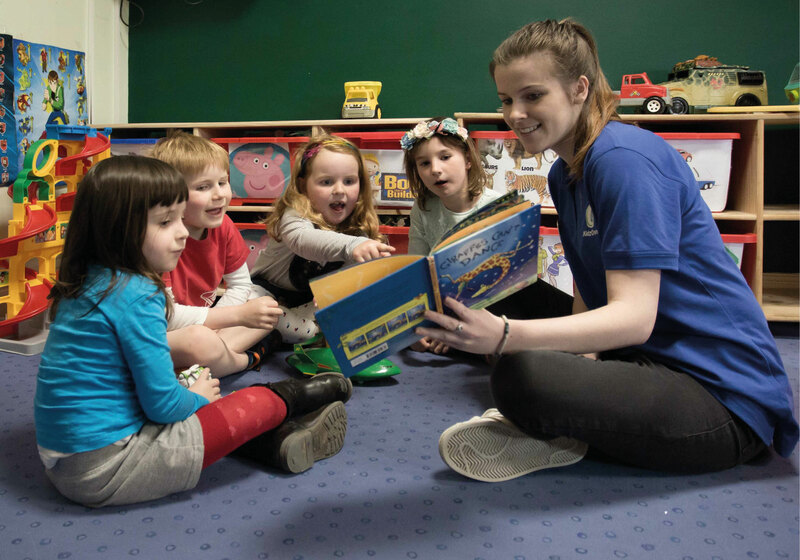 The Beechdown Creche is run with a team of qualified and experienced staff, providing a happy and safe environment for your child to play in whilst you use the Club's facilities. The Creche is registered with OFSTED, on the voluntary register to care for children from 0-3rd birthday. You may book up to one week in advance either in person or by calling the Creche direct on 01256 362206. One space per child per day and only for your own child. We operate a pay to book system. The Creche is paid for using vouchers purchased from the main Reception. £55 for 10 or a single voucher can be purchased for £6.00. One voucher pays for one session. 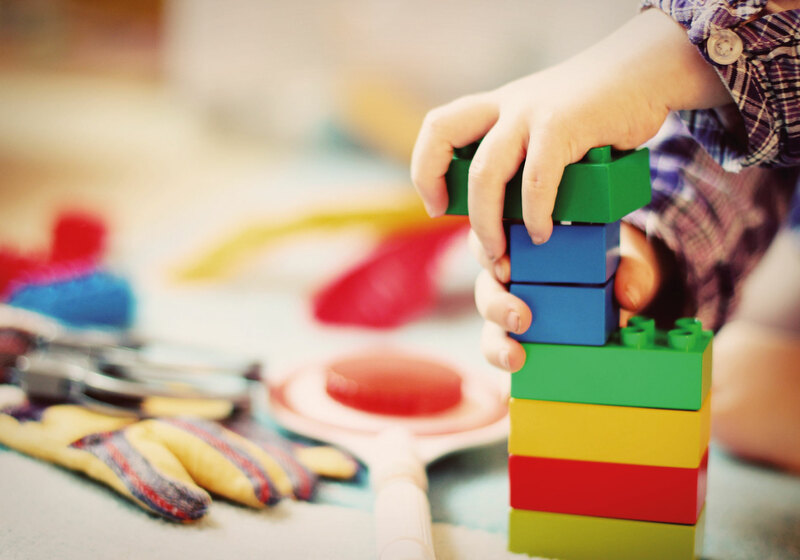 The Beehive is run within Creche, a fun, safe environment, giving the children the opportunity to explore their own creativity, whilst you enjoy the Clubs facilities. Activities include craft, physical play, imaginary play and stories. This is a non-bookable facility, included in Kidz membership. Spaces are on a first come first served basis, for one 2-hour sessions per day. The KidzKlub is a supervised hang-out area for children. 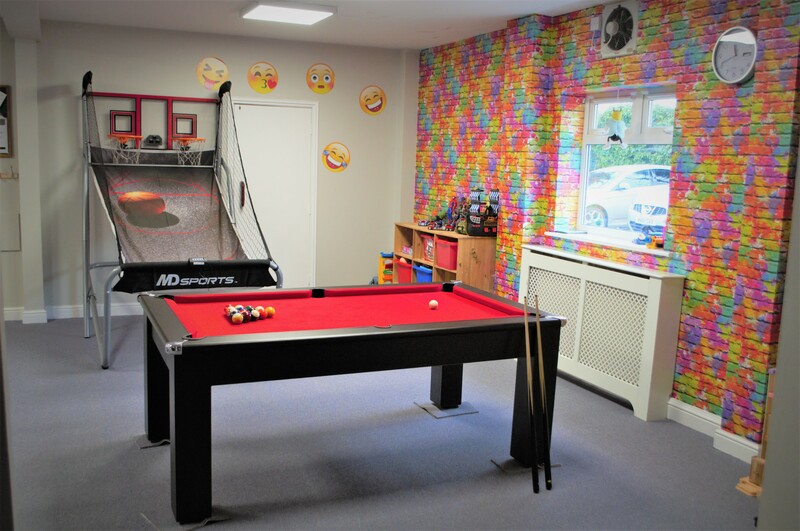 Pool table, basketball hoops, Xboxone, and many board games to create a fun environment that your kids want to visit! Dedicated arts and crafts activities throughout the month and collection service from some children's activities. This is a non-bookable facility, included in Kidz membership. *Children's activities linked to Beehive/KidzKlub. So parents can drop to coaching sessions and then pick up from Beehive.Kidklub. Times may vary during school holidays and bank holidays. 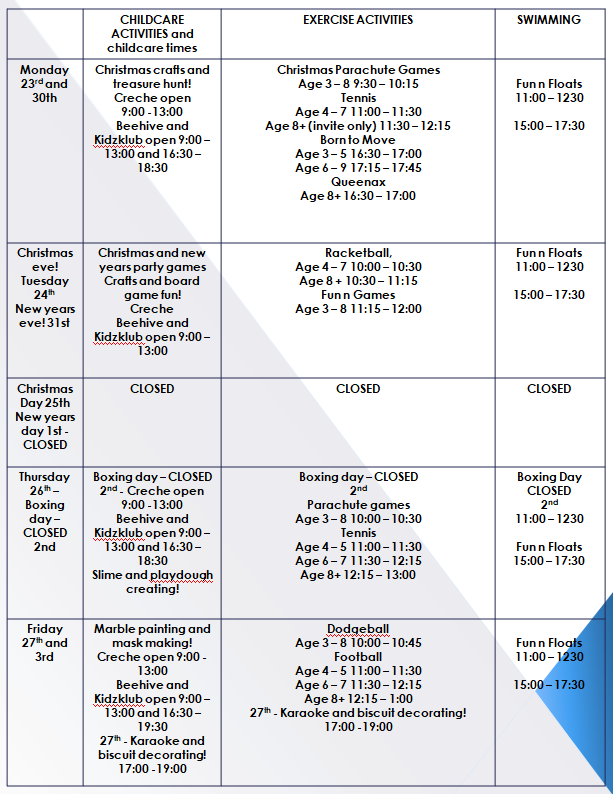 There are organised activities and coaching for the Over 4's throughout the week. Additionally, there are play areas throughout the Club and Gardens for them to amuse themselves. Children's activities are organised by age group. Select child's age and follow the column down the activities. 12+ year olds may use the gym, having had a gym induction; all day weekdays until 5:30pm and weekends until 5pm (when parents Plat) they may also attend classes marked 'GenT' on the class Timetable. Virtual classes marked Gen T are also available for ages 12+ provided the parent is also attending the class. See exercise class timetable for full details. 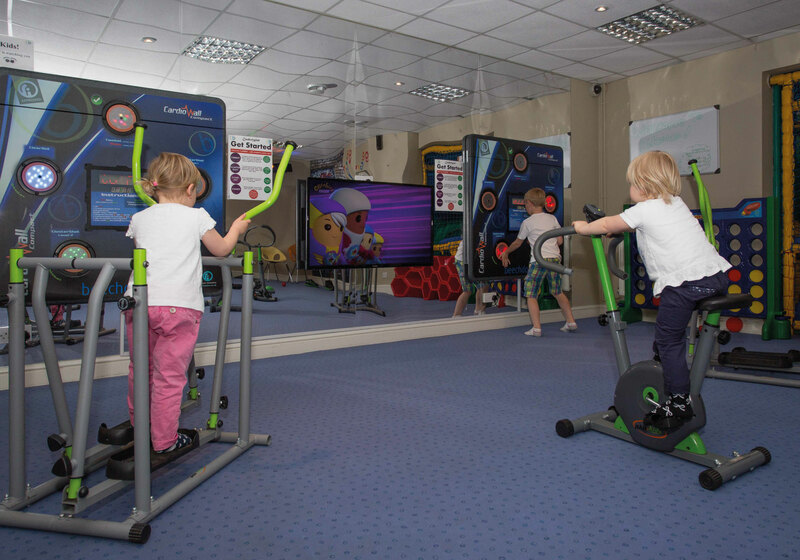 The place for all our young members with a kid's gym, Interactive Reaction WallGames, Table Football, Air Hockey, Playstations, Plasma TVs, Fabulous KidzGym. We also have the Jungle Gym - an indoor soft-play area with 2 floors, ball pit, slides and much more. 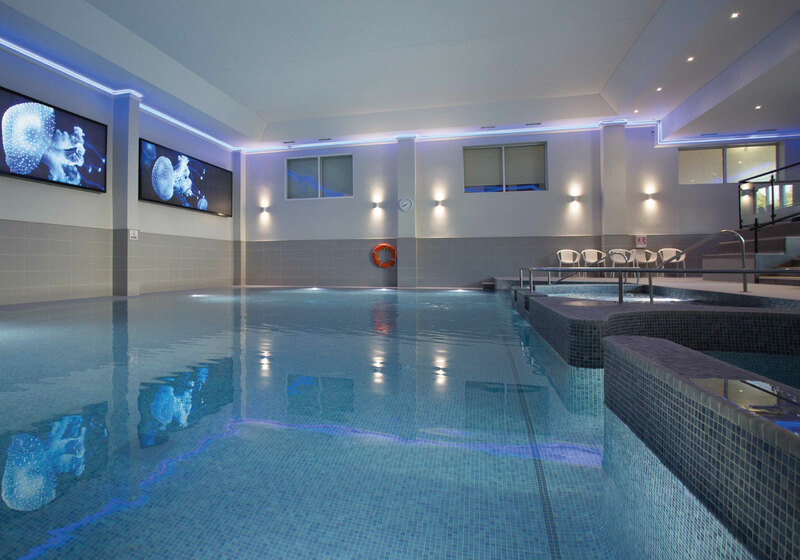 The Pool is the perfect place for splashing around with 2 dedicated kids swim times every day. We run a Fun 'n' Floats session every weekend 14.00-16.00. It's a fun session for parents to enjoy with their children. Swimming Lessons are available during school terms. We have regular courses for children from age 3 years. They are taken from Stage 1 where children cannot swim unaided right up until Stage 7 where they focus on developing their technique, endurance and efficient turns. Parents must supervise their children in the pool hall at all times. Jenny is our qualified swimming teacher. She has taught all levels from beginners to competitive swimmers, including groups and individuals from the very young to the more mature. Jenny is a keen recreational swimmer and has completed many open water events around the world and competed in numerous triathlons. She believes learning to swim is an essential skill for safety as well as health and wellbeing. Please note: Swimming lessons can only be booked by members, for their children. Children who's parents do not have a Beechdown membership will not be eligible to book swimming lessons. At this stage children cannot swim unaided. They will build water confidence including jumping in, gliding, floating and putting their face in the water. They will learn to travel on front and back. By this stage children can swim 5 metres on front and back. Breaststroke and Dolphin kick are introduced. Children will work towards swimming a length of front crawl with face in the water by the end of this stage. This stage focuses on swimming full lengths of the pool without aids. Front crawl and backstroke will be developed along with Butterfly kick and breaststroke. This stage focuses on correct technique, breathing and timing. Children are able to swim all four strokes for two or more lengths at a time. This stage focuses on developing technique, endurance, efficient turns and also some personal safety and simple rescues. By the time children reach Stage 7 and above, they are able to swim multiple lengths of each stroke. Timed swimming is introduced along with swimming sets.